2014: The Year In Tiny Desk Concerts Surveying a year of concerts that took place behind a desk in NPR Music's offices, we offer up highlights from T-Pain to the Pixies to a 12-piece Balkan brass extravaganza. 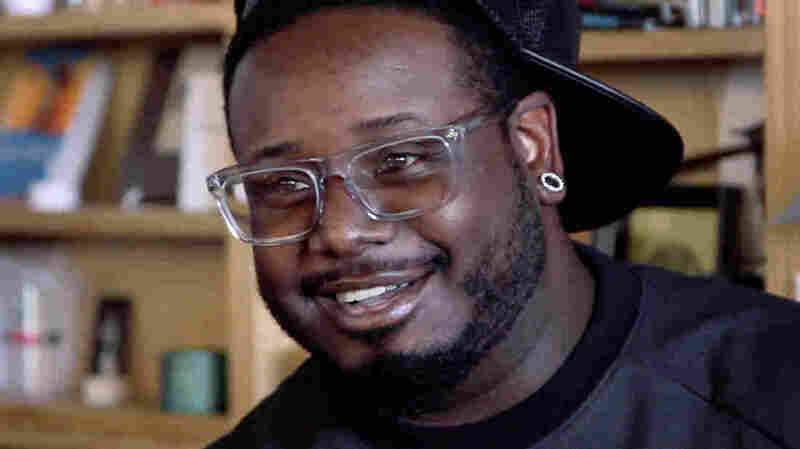 T-Pain's Tiny Desk Concert has been viewed 6.6 million times on YouTube alone. It's been a remarkable year for Tiny Desk Concerts: We've published a whopping 83 of them in 2014 alone, eclipsed the 400-episode mark without noticing, helped T-Pain score 6.6 million YouTube views, and launched a contest to bring an unknown band to the Tiny Desk in 2015. So it wasn't easy to whittle down this list of highlights, which is only about 70 spots shy of definitive. (For the full list, click here.) Truth be told, you should really set aside a weekend and watch all 83 sets back-to-back. But until then, here's a cross-section of favorites, from pop to opera, hip-hop, jazz, rock, country and whatever genre is broad enough to contain the Sun Ra Arkestra. Every year, we put together a handful of Tiny Desk Concerts whose crowds of colleagues and friends threaten to buckle the floor beneath our feet. This year, we experienced the aforementioned T-Pain set, followed by Cat Stevens later the same day; a visit from Jackson Browne; and a special Saturday-afternoon show where people took time away from their busy barbecuing schedules to watch Conor Oberst and his band. But the Pixies actually had the audience standing in windowsills and on desks to see Frank Black over a formidable wall of heads and shoulders. Microphone Check's Frannie Kelley knew that putting the King Of AutoTune behind the Tiny Desk would bring out a side of his sound that few had heard. Plenty of people have heard it now: For perspective, the most views a Tiny Desk Concert had ever received on YouTube were the ones featuring Adele and The Avett Brothers, each at around 2.3 million. T-Pain passed that in a matter of days, and with good reason. Between his nervous charm and his knockout singing voice, we didn't want to let him leave. We could have fit this set into a few categories, especially the ones pertaining to volume and visuals. Moon Hooch's music doesn't sound tantalizing on paper — a drummer with two saxophonists who often blow through traffic cones — but it's almost terrifyingly intense live. It's also some of the most invigoratingly, wonderfully danceable music in the world, as our colleagues quickly discovered. Luluc and Rodrigo Amarante each made some of the most comfort-inducing music of 2014: Luluc's Passerby and Amarante's Cavalo are both engineered to quiet nerves and quietly but surely overwhelm every conceivable stress. In person, both were as charming as their music is peaceful — which is saying a lot. Talk about your apples and oranges: Public Service Broadcasting plays sample-driven instrumental music against a backdrop of film strips and other vintage visuals. Sun Ra Arkestra, performing a set we streamed live on Halloween, came out in flashy robes, headwear and a visual aesthetic mixing science fiction and Egyptian imagery. Saxophonist and bandleader Marshall Allen does score bonus points for being the year's oldest Tiny Desk Concert performer at 91, but he's just one piece of the Arkestra's brightly hued puzzle. Pat Benatar and Neil Giraldo have some of the easiest husband-and-wife banter in the business, but even they couldn't top The Foreign Exchange, whose set split almost evenly between luscious R&B and Phonte Coleman's salty, strange monologues — part comedy act, part inspirational sermons, all endlessly charming. Angel Olsen's set was pretty damned powerful, too, but if you can make it through "Waiting On June" without bawling, then you're officially tougher than we are. And think about it: Where will you find a more menacing throng of roughneck bruisers than in public radio? The granddaughter of Hank Williams, Sr. (and daughter of Hank Williams, Jr.), Holly Williams chronicles two lifetimes of love in a poignant ... sorry, let's just skip to the next one. It's gotten pretty dusty in here. In 2012, Reggie Watts crafted a Tiny Desk-specific song on the spot, a tradition picked up by Grammy-winning jazz pianist Robert Glasper earlier this year. But "Tiny Desk Jam" wasn't even the highlight of Glasper's 25-minute set; that distinction belonged to "Trust," a glorious collaboration in which Glasper and his band teamed up with former Floetry singer Marsha Ambrosius. Truth be told, it's hard to even narrow this one down: For example, Bob Boilen loves a singer named Asaf Avidan, who seemed like he'd be pretty quiet and unassuming until a gigantic voice poured out of him. For the win, it came down to two very different talents: opera singer Joseph Calleja and soul man Paul Janeway, lead singer of St. Paul And The Broken Bones. Calleja's voice is far more restrained than Janeway's — there are foghorns more restrained than Janeway's voice — but both overwhelmed us with their sheer lung power. The 10-piece salsa group Bio Ritmo could have easily taken this spot, but our ears are still ringing from the horns and drums of the wonderfully clamorous Balkan brass band Fanfare Ciocarlia. The group's 12 members filled the space behind Bob's desk with more sound than it could possibly hold — so much, in fact, that the music leaked well beyond the building's fourth floor. It may still be reverberating, both in the walls and in our chests.